Judy was born and raised in Wichita, Kansas. At age 6 she became aware of her talent for art and her parents were astute enough to encourage her interest with private art lessons. Judy later went on to earn a BFA & a MFA from Wichita State University. In 1968, Judy married and moved to South Florida, and preceded to raise three outstanding boys. During her parenting stage, Judy continued to pursue her art practice, but was unable to devote the kind of time she desired. She credits art with really saving her life after having survived a very challenging marriage and the rigorous routine of raising three boys. Her art is driven by a passionate interest in women’s issue, the complexity of human relationships, sexuality, the environment, spirituality, music and poetry. Her latest paintings create a visual interpretation of the relationship between the female gender and its connection to nature and the evolution of humanity. Her recent abstraction on towels explores supernatural ideas of quantum being and energy. 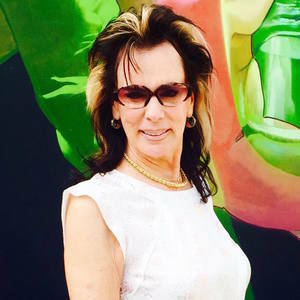 Judy currently maintains her own studio in Hallandale, FL, and is actively engaged in the South Florida art community. Judy also believes that art can play a very critical role in the social, economic and political development of the South Florida Community.